That word, when pronounced in a theater or an amusement park will cause a panic, but it does not prevent some parks from adding a little fire to build excitement. How did it start? On the banks of the Rivers of America at Disneyland (Anaheim, CA) all the way back in 1955. In order to make the Rivers of America and the Santa Fe & Disneyland Railroad more realistic, WED (Walter Elias Disney) Enterprises, the ancestor of Walt Disney Imagineering (WDI), created various scenes and tableaux that would be seen from the various modes of transportation. The scene that interests us was the “Burning Cabin”. Basically, you had a steel pipe running to what appeared to be a log cabin, but was made with concrete and other uninflammable materials. Various nozzles were set up around the house and the propane lit, giving the impression that the Cabin had just been set ablaze by either “Unfriendly Indians”, “Evil River Pirates” or finally, a klutzy Moonshiner who blew up his own still. Sadly, in 1991, the Cabin stopped burning at Disneyland and the cabin finally restored to what it would have been before the 30 plus years blaze. The Burning Cabin at the Magic Kingdom burned from 1971 to 2006 and today, smoke effects are used on the door for the illusion. Large flaming torches were incorporated to the façade of the Enchanted Tiki Room that opened in 1963 at Disneyland. The facade of the Tiki Room with the various torches. In 1968, Judge and former Houston mayor Roy Hofheinz set upon constructing a new entertainment complex near the Astrodome stadium in Houston, TX. When the park opened on June 1st 1968, the park featured many unique attractions, with a few coming from Arrow Development. The ride that interests us for this burning article is the Lost River Adventure. It featured an Arrow designed guide boat system where each boat sat 25 riders and you had a tour guide on board. The ride originally featured 9 show scenes and was similar to the Disney Jungle Cruise. One of the scenes featured a large Tiki statue that would use propane flame throwers to create a small fire effect. In 1976, the ride was revamped and became the River of No Return. 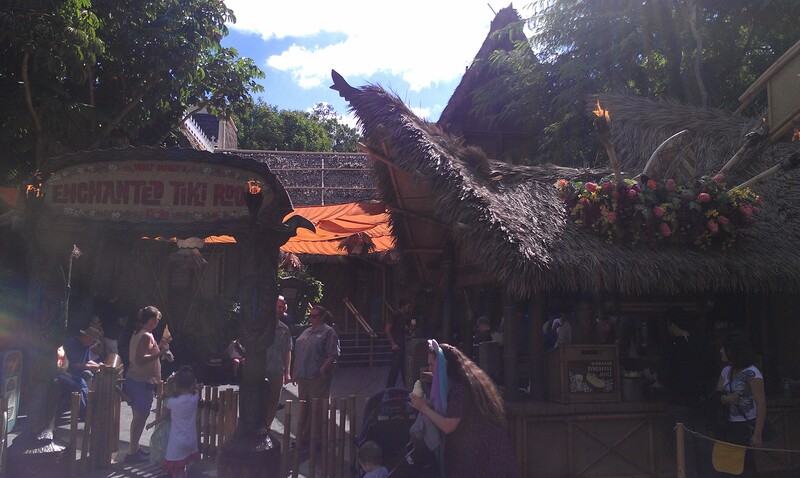 The Tiki statue was changed to a King Kong head and the fire effect was improved a lot. Combine that with the extreme heat and humidity that categorizes Houston in the summer and it was a shocking experience for riders! The ride was shortened and extensively modified after 1983 when the area over it became the ride path for the Arrow-Huss Suspended Coaster, XLR-8. It became just “The River Ride” and was mostly an open float through a field with most of the effects and scenery removed. The ride finally closed for good in 1988. 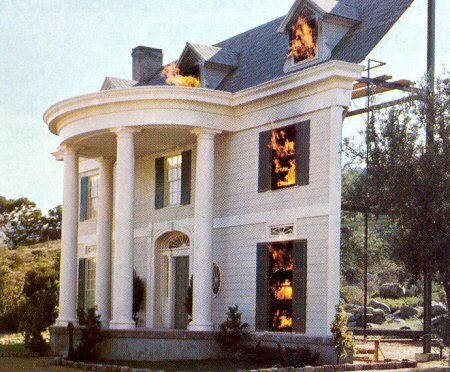 Universal got into the Fire effects business in 1973 when it introduced the “Burning House” to the World Famous Studio Tour. Originally located on the Upper Lot, near the Amphitheatre, it was relocated down the hill when the Studio Tour expanded into what is now the current theme park. The idea was simple: a movie set façade constructed out of material impervious to flames and a few nozzles installed in the windows provided the illusion that the grand house was on fire. 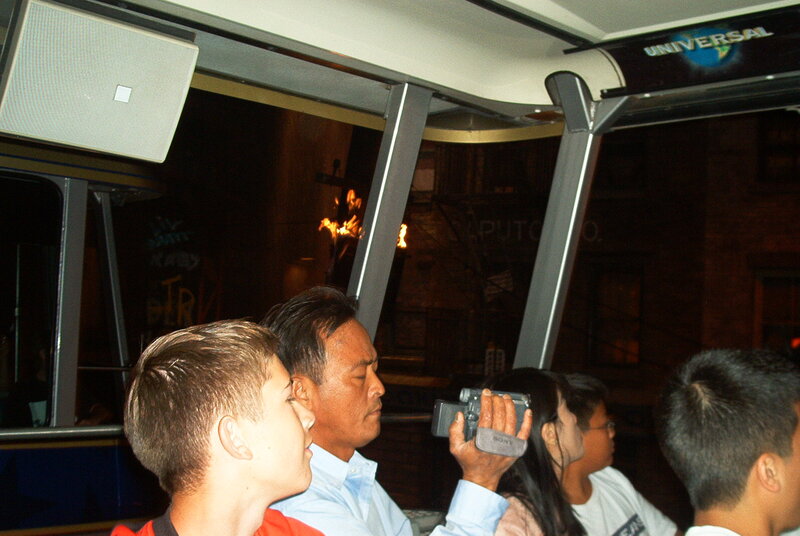 The effect was turned on as the trams passed, in order to show that you can control effects when shooting movies. A big addition to the Studio Tour was in 1976. After the success of the movie Jaws, released in 1975, Universal turned its eye to an underutilized facility of its back lot: Singapore Lake. Originally used to show weather effects using a smoke machine and wave machine, it was drained and an elaborate show installed. The story went like this: the tram went to the water on Amity Island and travelled on an old dock. A fisherman was seen fishing and then we saw the shark. The shark dragged the fisherman under in a pool of blood and then, would grab a yellow buoy. He would drag the buoy and would cause part of our dock to collapse, causing the tram to tilt to the right toward the water. The shark itself went through a few identities, starting off as more goofy than scary and they eventually settled on its current more realistic appearance. Besides that, the show remained more or less the same until 2000 with the only change being the addition of a smaller dock in front of the tram. This dock had a gas pump and various barrels that caught fire when the shark pulled the dock away. In late 2000, the show closed down and when it came back in 2001, it was re scripted and improved with the fisherman replaced by a police diver. The hapless Diver was already in the water when the tram entered in the area and he soon become Jaws bait as our tram guide tries to tell him to exit the water. The scene new name “Jaws on Fire” made sense since the small gas dock was joined by a longer dock that stood behind the shark as it lunged out toward riders. 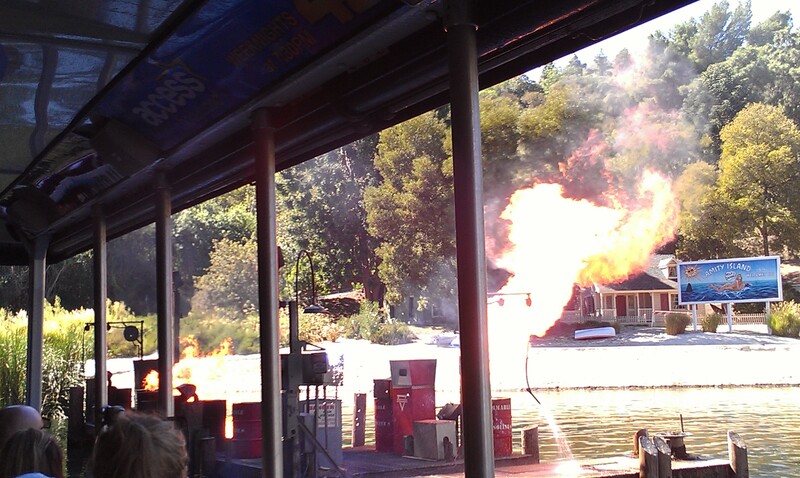 When the gas dock is damaged, it’s filling gun flies around spraying water on riders and then catches fire in a large fireball. 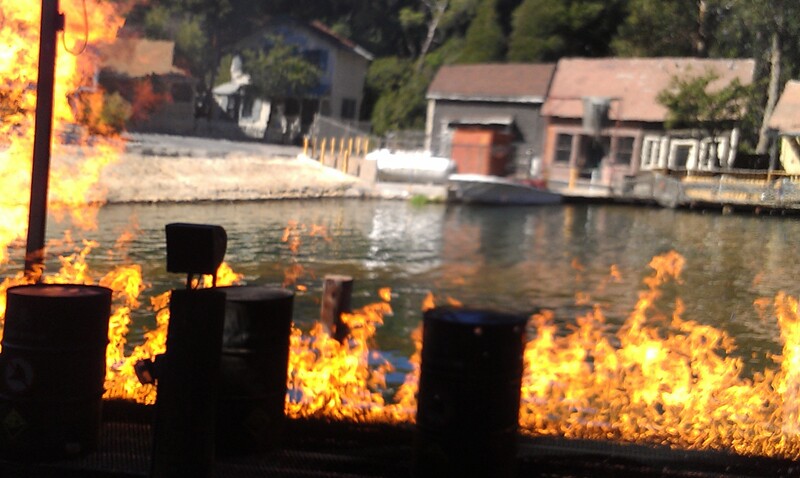 Then, the fire run on the other dock until it reaches the other pump that also blows up. 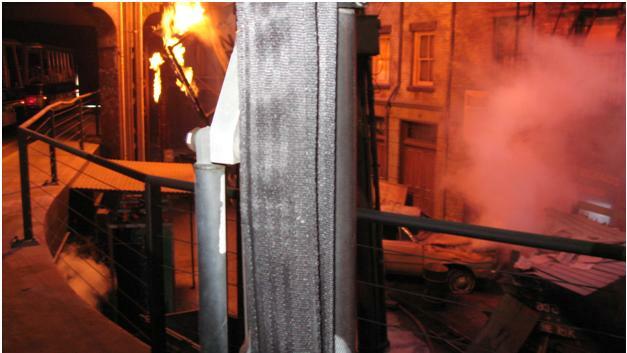 After that, the fire would run again and one final explosion would end it as our tram leaves the dock. First gas pump and running fire. Picture of the fire running on the dock. This picture illustrates very well a challenge of fire effects: the soot and charred aspect of the props. Due to the need to have a visible effect, you need to have an inefficient and dirty flame. That leave a lot of residues and in the picture above, you can see that the various props on the dock are completely black and would require either replacement or a good cleaning and repainting. In 1984, Universal Studios Hollywood built a new stunt arena to the right of the park entrance on the upper lot. The first show to perform there was the A Team Live! Stunt Show, featuring the characters of the popular TV show trying to stop a group of terrorists. Many large explosions were featured in this show. In the mid 1980’s, Universal called on Disney veterans Bill Watkins, Bob Gurr and others and they created the King Kong Encounter for the Studio Tour. What is remarkable is this 6.5 millions $ attraction was incredibly realistic and packed a full ride experience in two minutes. Opening in June 1986, he Tram would enter the custom 26,000 square feet soundstage and then stop. We were in the middle of 1976 New York City on an elevated highway and we’d see on TV’s inside the nearby apartment building a special News Bulletin. The anchor revealed that King Kong was on the loose! Police could not stop him and he cut to Kelly King, a reporter inside a new copter that happened to be hovering above our head. Police on loud speakers advised her to leave as King Kong had been spotted nearby. She refused to leave and tried to warn us. Unfortunately, King Kong swatted her helicopter which got tangled into power wires. It crashed to the left of the tram and the engine caught fire and then the fire ran on the landing gears. This simple effect was done by supporting the tram by the back and you’d see various tangled wires. The helicopter was moved by a pneumatic cylinder and it was reliable. As the tram was quite long, an additional fire effect was present next to car 4 where a power pole would explode at the same time. This made sure everyone had the thrill of feeling the heat of a large gas explosion. You can see the hanging burning helicopter in the background. Upon further research, this is the exploding power pole near Car 4 of the tram. This picture shows the fallen helicopter and incredible details in the set. 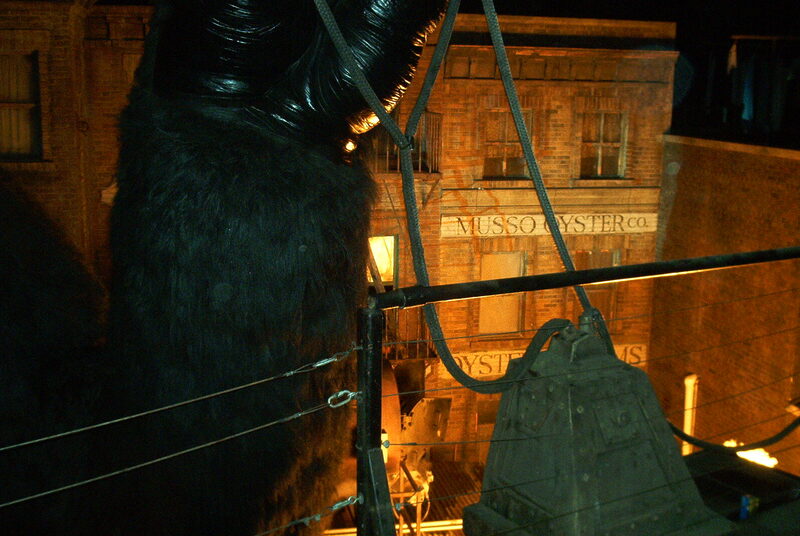 King Kong stood at the end of the soundstage and was a clever illusion, with the bottom of him hidden and was a simple counter balance system, where he actually did not move the bridge. The moving bridge that we are on was mounted on a hydraulic system and thanks to Teflon covered plates; it slid around and rocked us as if King Kong was shaking the bridge. It actually was the opposite: King Kong held on to the bridge and it’s the bridge that moved him. The moving parts on him were in his head that had over 60 movements. 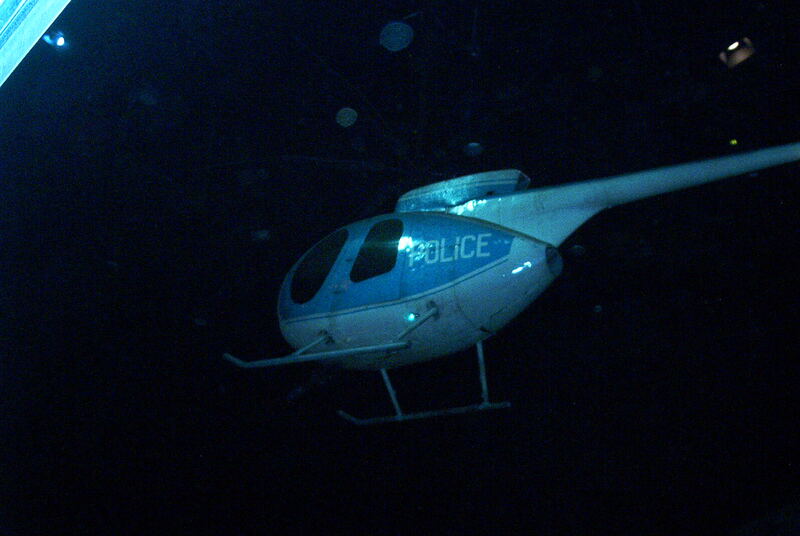 The helicopter that shoots at King Kong. It is a near full size reproduction of the real deal and the spinning rotors were reproduced with large ropes. From our point of view, it is a clever illusion that look like the real deal. 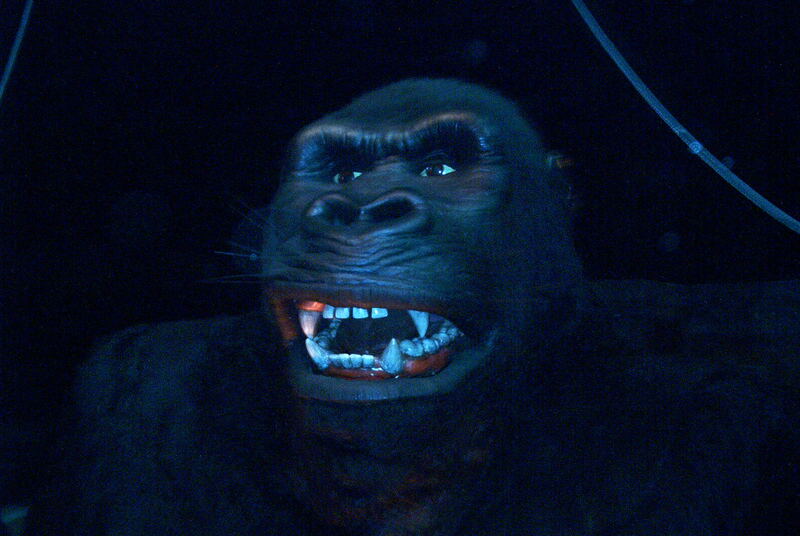 The amazingly detailed face of King Kong. He even had banana breath! Fire was again used here, as a large flame strip was mounted to his right and random balls of fire would shoot up from what appeared to be under the bridge. Also, there was also a large storage tank next to him that would spew smoke as if hit by gun fire and then large flames would shoot up. Fire shoots up from the large storage tank behind his arm and to the right. Sadly, the attraction burned down in the June 2008 large fire that gutted part of the Universal back lot. This entry was posted in Special effect and tagged Bob Gurr, Disneyland, Enchanted Tiki Room, fire, Hollywood, Jaws, King Kong Encounter, Magic Kingdom, Universal Studios. Bookmark the permalink.